So I decided that I was going to make a plant tower. 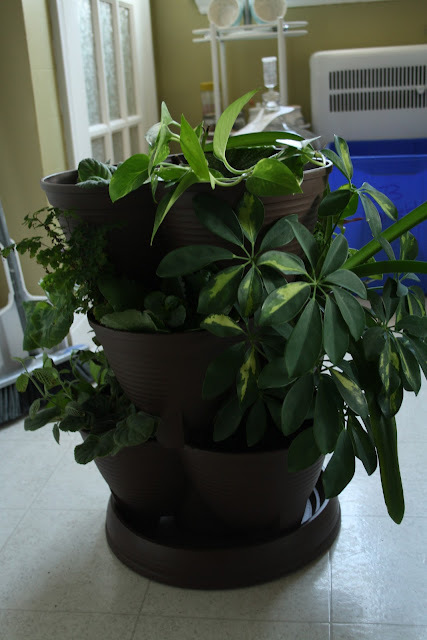 I had all these plants all over my house, all that did well in filtered light so a tower was a great option for them. I bought this tower for outside in the summer but I thought this might work out really well. I don't do a lot of DIY posts, but I'd like to, so I'm giving it a go! Step 1- Find a potter that will work for you. Step 2 - Gather all your plants and pick a space (easy to clean after) to do this project. Step 3- Make sure you have heaps of soil, fill each layer of the tower to 3/4 full of soil, leaving room for putting in the plants. 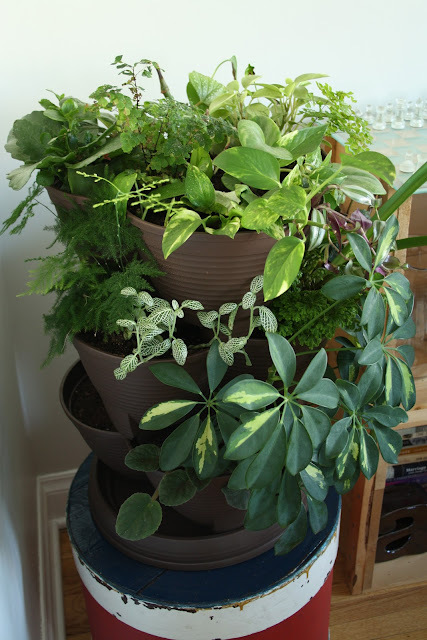 Step 4 - Pull out your plants from their pots and start planning them into the first/bottom layer of the tower. Place the plants close to the edge of the potter (when you add the next tower layer on top it makes it easier to not smoosh your plants and you can adjust their placement when the tower is all stacked). Step 5- Take out the rest of your plants and continue on in the next layers. Make sure you work with the colours of the plants to get the best contract and combination you can. If some plants are too tall for the tower cut them down and propagate them to plant in the tower once they have grown roots. Step 6 - Stack the tower and repeat with each layer. When you get to the top layer you will want more plants then you used for the other layers. I found that I thought I had enough but I had to purchase a few more plants. Step 8- Enjoy your tower! I have three different types of ferns in my tower and I mist them (and the club moss and nerve plant) every day, a couple of times a day and they just love it! Hope you found this helpful, and I'd love to see any plant projects you've done! 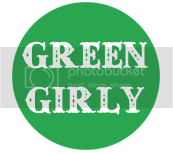 I was looking for birdhouse projects when I came across your site. This tower is lovely! oh thank you! ya it was a lot of fun to make!